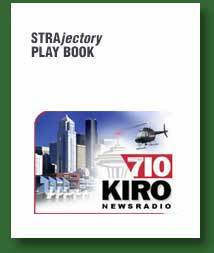 KIRO Newsradio in Seattle was looking for an innovative, comprehensive marketing plan that was not a boilerplate solution, something that would solidify their vision, reunite and energize their staff, maximize their sales, and differentiate them in one of the nations most crowded radio markets. Our charge was to develop leading-edge solutions to vault them far ahead of their competition. We have had the opportunity to do this for many forward-thinking companies of all sizes.